Offering a unique selection of gift products, many of which can be personalized with an embroidered name or monogram. 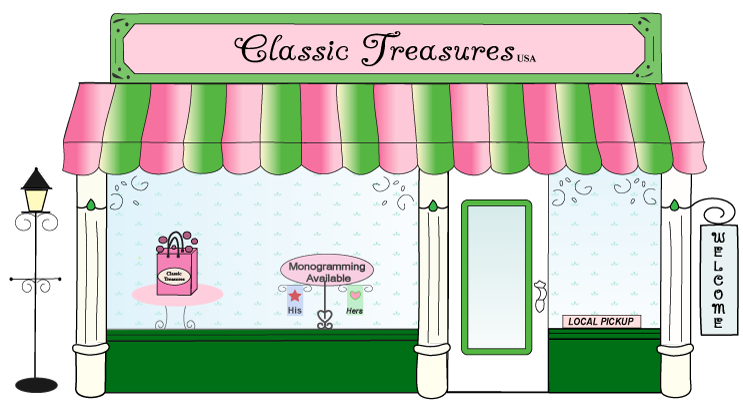 Classic Treasures seeks out unique gift items that you will be proud to own or give as a gift. Our goal is to offer products that can be categorized as "classic treasures". We're sure you will find one of our treasures to your liking. Selected treasures can be monogrammed to make them even more special. Your baby will love to be wrapped in this fluffy double-layer fleece blanket trimmed with satin. An .. The Paris stroller blanket is the perfect size for a newborn and works wonderfully for a stroller or.. This cuddly fleece and satin blanket is so soft your baby will love it. Lush creme fleece backed in .. This cuddly fleece and satin blanket is so soft your baby will love it. Lush creme fleece all backed..